70 percent of Ukrainians think, that achievement of peace in Donbass is only possible through compromise, according to opinion poll. 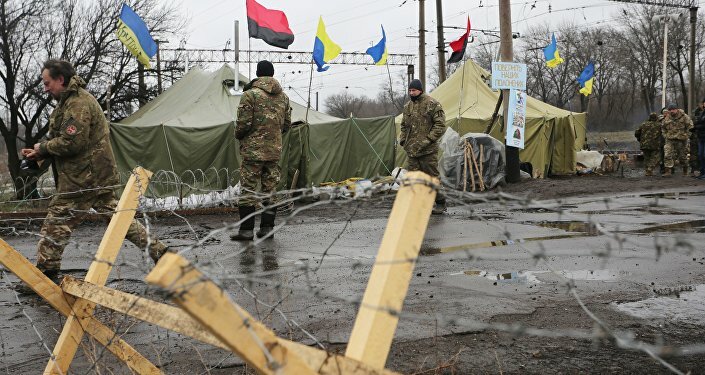 KIEV (Sputnik) — The majority of Ukrainian citizens think that making compromises is necessary for achieving peace in the country's eastern Donbass region, a poll conducted by the Ilko Kucheriv Democratic Initiatives Foundation (DIF) showed. According to the results of the poll, published Sunday, 70 percent of Ukrainians think, as they did one year ago, that achievement of peace in Donbass is only possible through compromise. At the same time, only 18 percent of respondents agree to make any concessions, while more than a half of those surveyed indicate that not every compromise is appropriate. Peacemaking in Donbass by means of force is seen only by 18 percent as a way forward. According to the survey, willingness to compromise declines as geographic distance from the military actions increases. Therefore, commitment to achieving peace in Donbass by any compromise was shown by 25 percent of respondents in eastern Ukraine and by only 10 percent of respondents in western Ukraine. Regarding the political future of the self-proclaimed Lugansk and Donetsk People’s Republics (LPR and DPR), 55 percent of Ukrainians see it as a part of Ukraine under pre-war conditions. One in five respondents were favorably inclined toward the possibility of granting of a broad autonomy within the boarders of Ukraine to these territories. Only 9 percent of interviewed welcomed separate existence of the republics or their joining Russia. A total of 60 percent of respondents supported the emergence of an international peacekeeping contingent in Donbass. It is worth noting in particular, that a large number of respondents (19 percent) were unable to answer this question. The report presents a research carried out by the Ilko Kucheriv Democratic Initiatives Foundation June 9 to June 13, 2017 covering over 2,000 people above the age of 18.